Published: Aug. 2, 2013 at 01:39 p.m. Updated: Aug. 3, 2013 at 10:35 p.m.
CANTON, Ohio -- We recently were tasked with coming up with the most egregious snub in the Pro Football Hall of Fame as you can read here. Go ahead and check it out. I will wait. Pretty good, huh? 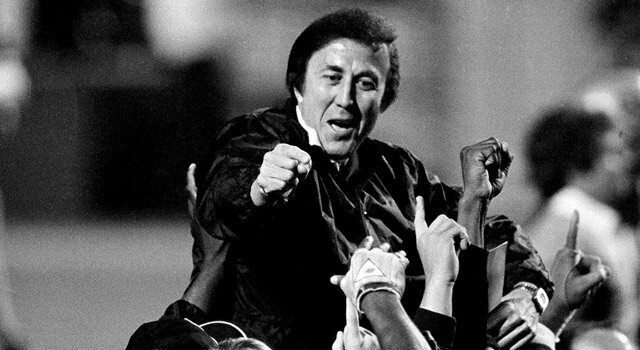 Of course, I came up with the only serious, well-thought-out answer of Tom Flores. His induction has been long overdue. Although, I fear that it might never come. After walking around and talking to some people at the Pro Football Hall of Fame, it's going to be a tough task to get Flores in. Which is nonsense. So with that in mind, in addition to Flores, I've come up with six guys who should be in the Hall of Fame, though I fear they will never be inducted. Before you get bent out of shape and ask for Jerome Bettis, Tim Brown and Ray Guy, realize I left them off because they likely will get in. Well, not Bettis. Nobody outside of Pittsburgh or Regis takes his candidacy seriously. One of the biggest misconceptions is that the NFL runs the Pro Football Hall of Fame. It does not. So, if this is truly a "Pro Football" Hall of Fame, then the greatest quarterback in CFL history needs to be in there. The Cowboys' famed "Triplets" always get the publicity for the team's early 1990s dynasty. But it's hard to argue with Novacek, who more often than not found a way to get some of the tough yards when Dallas needed it the most. I have faith Ray Guy eventually will get his gold jacket. But the voters always seem to leave out special-teams performers. Tasker certainly was one of the best on special teams, but without tangible stats to back it up, he sadly will be overlooked. Maybe I'm too quick to write off Coryell, who could end up being a veteran's committee nomination one year. But if it didn't happen after his death, my fear is he'll never get in. Sad, considering Joe Gibbs and John Madden often credit Coryell for them getting into the Hall. It's laughable people will try to get Jerome Bettis into the Hall of Fame because he hung out for a long time being average. Davis is the guy who helped push John Elway over the top for two Super Bowl titles and likely is going to be passed over because of the brevity of his career. Did you know Washington broke the NFL's color barrier one year before his UCLA teammate, Jackie Robinson, played for the Brooklyn Dodgers? Honestly, Washington needs to be enshrined in the Pro Football Hall of Fame, and it's an embarrassment that he's not even being considered. "Best ways to determine your fantasy draft ord..."